The site is located in Nechells, Birmingham and occupies 0.49 hectares. The site was formerly occupied by ERA and was utilised for the manufacture of locks and ironmongery. The proposed residential development on the site [by Midland Heart] comprises of 33 houses. 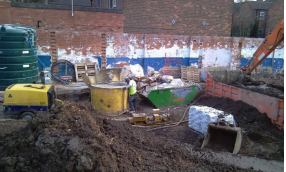 GIP carried out extensive site investigations to identify the nature and extent of site contamination. The main contamination sources were identified in the central area of the site (beneath the floor slab of the former building). The prime contaminants of concern were total petroleum hydrocarbons [TPH] – the analytical data confirmed the presence of elevated levels of aliphatic and aromatic C16 – C21 and C21 – C35 TPH. The nature of the contamination was consistent with historical activities on site – lubricating oils would have been widely utilised in the manufacture of locks and associated ironmongery products. Three distinct contamination areas were identified based on analytical data provided by GIP – these areas were delineated based on a TPH threshold value of 1,000mg/kg and coincided with the historical location of machine sumps, oil storage areas, drainage runs and likely spillage areas. The source contamination extended to depths in excess of 3.5m bgl – this was primarily due to the sandy geology associated with the site. Significant TPH concentrations were recorded within these areas (↑30,000mg/kg). GIP also identified the presence of chlorinated hydrocarbon contamination within the groundwater, predominantly on the eastern side of the site. It was not possible to determine the contamination source from the site investigations – it was therefore assumed that the groundwater contamination was most likely due to spillages associated with historical [chlorinated hydrocarbon] degreasing activities on site and from chemical storage areas. The chlorinated hydrocarbons are likely to have formed a pollution source at depth [as chlorinated hydrocarbons are DNAPLs].